Understories of mesic northern hardwoods typically; appearing late and also sporadically. This late-maturing species is visible only late July through Sept., and is often hidden in the leaf litter. 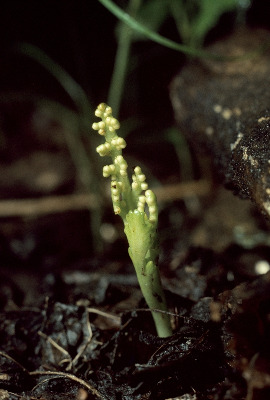 Plants are very pale, fleshy (almost succulent), and usually quite tiny. Botrychium mormo may seem to be confusable with B. tenebrosum, but besides being a later species, (B. tenebrosum appearing in May though it may persist into August), the hardwood forest habitat of B. mormo is different from the swampy coniferous or mixed woods that are the usual habitat of B. tenebrosum when it occurs in forested settings. MICHIGAN FLORA ONLINE. A. A. Reznicek, E. G. Voss, & B. S. Walters. February 2011. University of Michigan. Web. 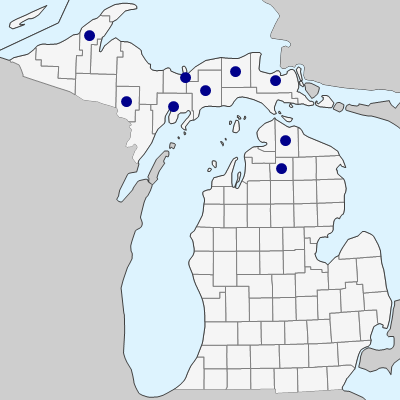 April 20, 2019. https://michiganflora.net/species.aspx?id=1783.